Have a once-in-a-lifetime experience by sailing under and around the iconic Golden Gate Bridge. 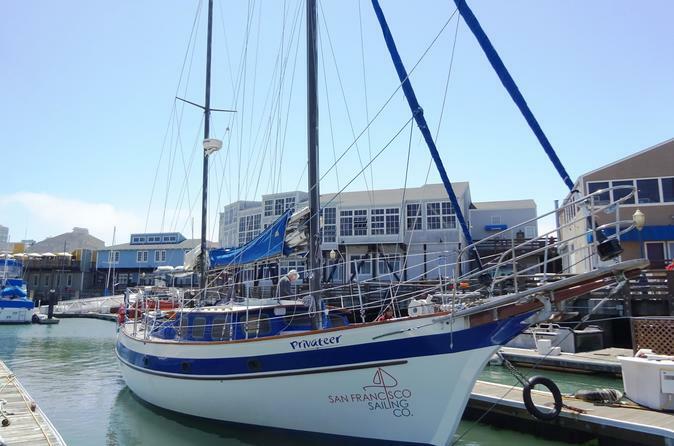 Sail off to the Golden Gate Bridge and enjoy panoramic views of the San Francisco skyline, Sausalito, Angel Island, Tiburon, and Marin Headlands. You'll also sail around Alcatraz and all the way to the Oakland Bay Bridge. Enjoy your choice of two drinks: Champagne, mimosa, beer, wine, soda, or water. Please note that this is not a narrated tour however the crew are accessible through out the sailing trip to answer any questions you may have. Board the boat in the morning, grab a comfortable place to sit or stand, and prepare yourself to be wowed by the Bay Area. Cruise on the boat right under the Golden Gate, one of the most iconic bridges on the planet, then sail through the bay, going back toward the Bay Bridge, getting an incredible view of the majestic San Francisco skyline on one side and Oakland and Berkeley on the other side. Sail around Angel Island as well as Alcatraz, the legendary former prison, and look out beautiful Sausalito and the Marin Headlands to the north. While there is no guide or narrative while on the ship, feel free to ask the captain and crew any questions about the cruise. Two drinks are included, including Champagne, beer, mimosa, wine, soda, or water.